Author: Jorgensen, R & Dole, S.
'Every chapter reeks of intellectual integrity, a strong knowledge of pertinent research literatures, and the wisdom of practice.' 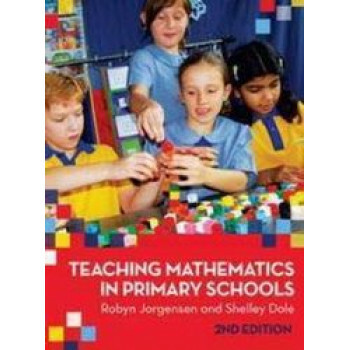 - Professor Ken Clements, co-founder of the Mathematics Education Research Group of Australasia 'This is an outstanding book: it should be high on the list of any primary school teacher set of references and a required text for pre-service teachers.' - Kath Truran in Australian Primary Mathematics Classroom Teaching Mathematics in Primary Schools moves beyond traditional lock-step approaches to teaching mathematics to emphasise how students can learn to think mathematically in the new times of globalisation and a technology-rich society. Based on current international research, the book focuses on learning outcomes and the general principles that underlie educational practices rather than any specific curriculum. Current approaches to mathematics education are explained and critiqued, and insights into why some students have difficulties with mathematics are provided. Teachers are shown how to encourage their students to develop deep learning in mathematics, and to relate mathematics to the rest of the curriculum. The authors firstly examine the philosophy behind mathematics and its impact on curriculum design, the history of learning outcomes, and theories on how students learn mathematics. They then present the key areas of mathematics teaching in detail: number, chance and data, measurement, space, and algebra. In each area, the emphasis is on problem-solving. Finally, they discuss practical classroom issues such as the trend towards developing students' capacity to think mathematically, broad approaches to teaching mathematics, planning for a whole school approach to mathematics, diversity and access, and assessment, reporting and evaluation. New material on numeracy, early numbers and fractions has been added to this second edition. It also includes new material on teaching mathematics in the middle years of schooling. With practical activities that can be implemented in the classroom, this book is an invaluable resource for students and teachers.